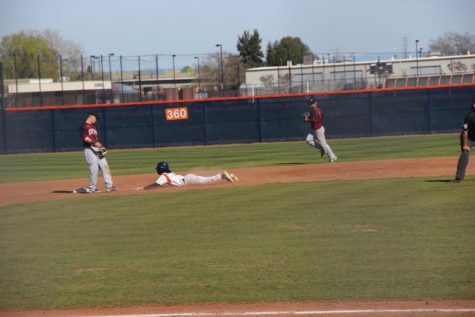 Freshman outfielder Robert Daugherty playing at the Hawks home game against Sacramento City College on April 16. 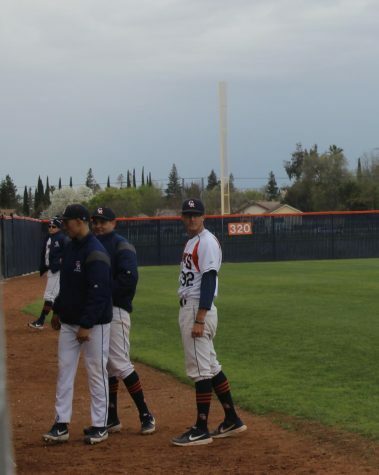 Cosumnes River College’s baseball team faced off against the Sacramento City College Panthers on April 16 in a home game, winning 9-4. 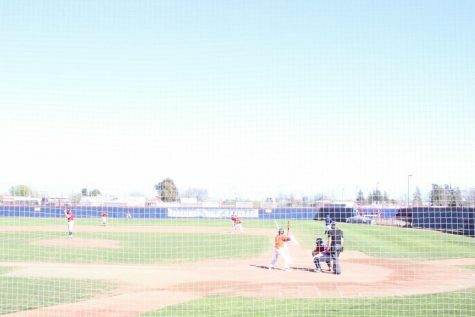 It was a hot day and the match started slow with barely any action until the third inning. 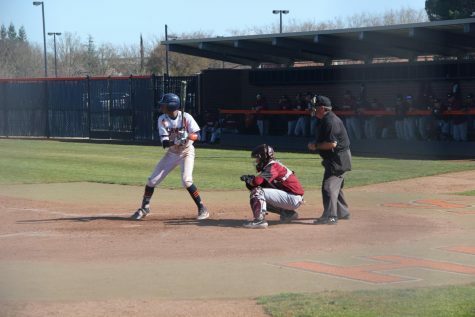 At the top of the third inning with runners on second and third base, the Panthers got a head start with two RBIs from freshman infielder Boston Romero. In the same inning the eighth batter up, freshman utility Brandon Langan, made a run, putting the score at 3-0 in SCC’s favor. 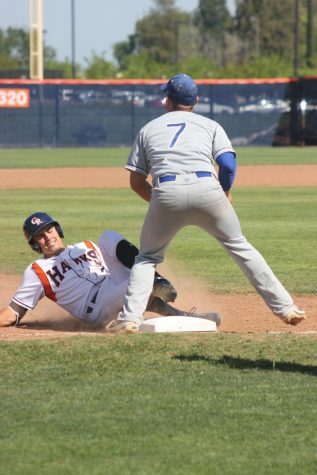 While the Panthers had a good start, the Hawks responded quickly in the bottom of the third as sophomore first baseman Tyler Blake got a RBI. The next batter was sophomore outfielder Alex Fitchett and he also got an RBI which brought the score to 3-2 with the Hawks down by one. 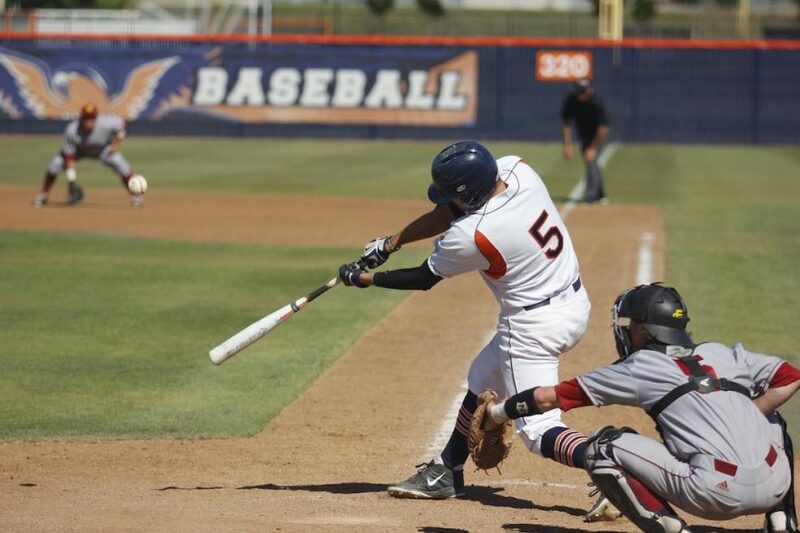 Another RBI was scored by the following batter, sophomore catcher Logan Marston, tying the game 3-3. The Hawks increased their lead as freshman outfielder Robert Daugherty got another RBI and four balls brought home Marston for a 5-3 lead. With bases loaded from the previous play, freshman infielder Devin Pettengill smacked the ball down center and got two RBIs. The Hawks were now in control with a fast-paced score of 7-3. Daugherty said that the team did really well with the inning strikes. “I felt that we came out ready to compete. 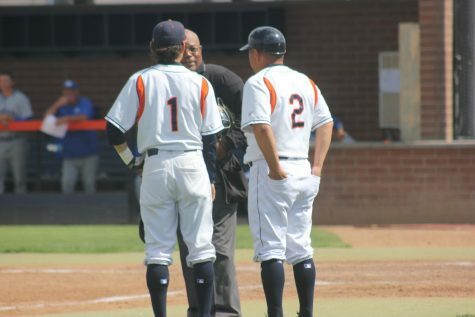 They, [the Panthers], got ahead early, but we sealed the game when the third inning ended,” Daugherty said. 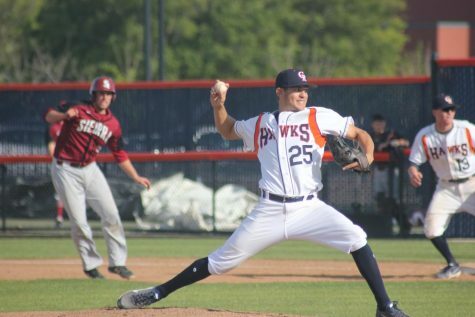 The game calmed down until the bottom of the sixth inning when the Hawks got another RBI from freshman catcher Nico Toni. The Hawks then scored their last run of the game in the eighth inning with yet another RBI from Fitchett, giving CRC a six point lead. 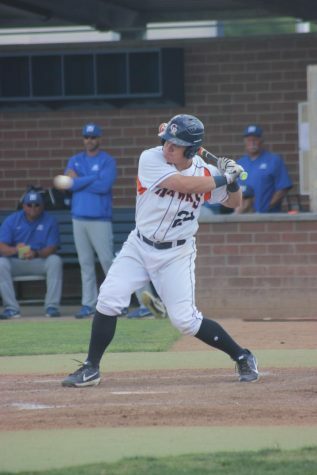 The Panthers showed a late reply in the last inning with a run from freshman outfielder Seth Vandergrift, but ultimately the Hawks won 9-4. Pettengill said that keeping errors low on pitching was also a key element as to why they won. 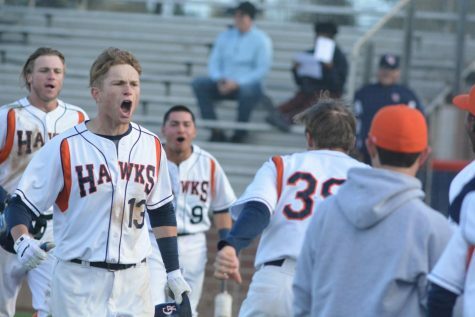 On April 17, the Hawks faced the Panthers again and once again prevailed, winning 8-7.